The response of the Netherlands to HIV has always been widely accepted as effective, pragmatic, rights based and inclusive of those most affected. At the national level examples include the prevention programmes which started in the early 1980’s, including in 1984 the setting up of the first needle and syringe exchange programmes when less than 1000 people in Europe were known to have HIV (the official test for HIV was not itself developed until early 1985). Internationally, the Netherlands has also always seen it itself as at the forefront of a rights-based approach to sexual and reproductive health. 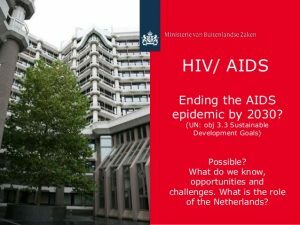 Regarding HIV and sexual and reproductive health development assistance, the Netherlands is globally among the largest contributors per capita, channelled through international mechanisms such as UNAIDS and the Global Fund to Fight AIDS, Tuberculosis and Malaria but also through international and Dutch NGOs. An example of being true to its principles was when the Netherlands stood up to the USA global ‘gag rule’ which banned federal funding for NGOs in foreign countries that provided abortion services or abortion advocacy by mobilising plugging the gap in funding that this caused. So though not perfect – no country response ever is – the Dutch have much to be proud of. So what are local organisations planning for the Conference? as well as Humanitas, Buddy Network, Buddy Care Positivo, Hiv + Borrel R’dam, Red Ribbon, Tijgertje, Suripositivos Foundation. As small grass roots organisation- often based mainly on volunteer input and dedication they deserve support and attention – do visit their stands! Positively Dutch is a partnership created by hello gorgeous, Atlas2018 and the HIV Association which will have a strong presence at the Global Village. Additionally, all three organisations are having other events. hello gorgeous ‘wants to normalize life with HIV by fighting stigma. We do this with our magazine that appears four times a year. The magazine is for everyone who lives with HIV. Anyone who has a boyfriend, girlfriend, child or a grandmother or grandfather with HIV. Everyone who works with HIV and anyone who is interested in HIV’. Online editions of the magazine in English are here and another is planned just before the conference. Hello gorgeous also has a Facebook page – so sign up for breaking news. 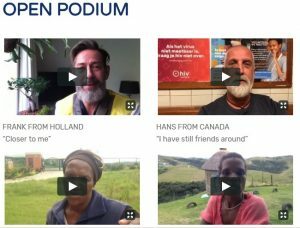 The OPEN PODIUM video testimonies and many others can be accessed here . 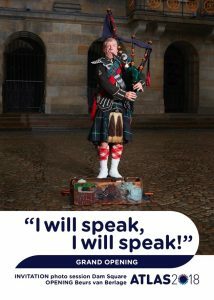 ATLAS has now announced the details of its fuller programme of events at “I WILL SPEAK, I WILL SPEAK!”. The grand opening will start on Sunday the 22nd in Dam Square at 14.00 with a ‘happening’ and then there will be a procession to the venue (the Beurs van Berlage, a few minutes away) with bagpiper Eric Windhorst leading the way. The exhibition and events run through until August 2nd, with some events taking place in the late afternoon and evenings. So, if you are not attending evening Satellite Symposia events at the RAI (the main conference site) which run through until about 8.30 pm – this may be a good time to drop in, especially as you plan your night out in central Amsterdam. If you are at the exhibition between 16:30- 17:00 on Wednesday 25th you can be part of the ‘Meet & Greet for the ‘Positive Flame’ in front of Beurs van Berlage. Other events organised by aidsfonds as part of AIDS2018 can be seen here. 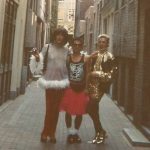 The Positive Flame tour will start at the Amsterdam AIDS monument on the 25th at 3.30 pm to 7:30pm, ending up at the DeLaMar Theatre with a special event The Power of Love which describes itself as’ informative, inspiring and heart-warming. It is a mix of medical information, experiences of people living with HIV, performances and films’. 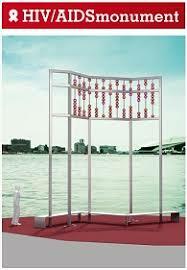 As I have previously mentioned the Amsterdam AIDS memorial, here is some more information. This monument stands looking out over the harbour of Amsterdam.It was unveiled in 2016. A description of the symbolism behind the monument is here. As yet, except for the candlelight memorial every May and December 1st World AIDS events, it is not yet seen as a place to gather, light candles, place flowers of remembrance; the Homomonument is still seen by many as the place to do this. Maybe the prominence the monument will get due to the conference will change this. 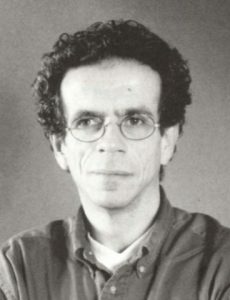 Martijn Verbrugge, was instrumental in many of the ground breaking initiatives and advocacy of the Dutch HIV Association. Read more about him here . 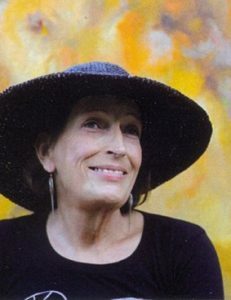 Gerda Gebker, was the co-founder of the Positive Women’s HIV Association of the Netherlands. There are many more people with HIV celebrated and remembered here on the website of memorial. If you have issues that you wanted covered in future blogs/or comment on this one/or thing you want to share-please use the comment box below. TB 2018 organizers are delighted to support attendance to TB 2018 and AIDS 2018 for community and civil society representatives from low and middle-income countries through a dedicated scholarship programme. Eligible candidates are invited to submit their application through this online form by Friday, 18 May.